Dawner Prince Boonar 入荷！！期間限定特価！！ 43,000円 SOLD OUT !! FARMLAND FX SIMO SupaFuzz S1975 新品！！ 42,000円 SOLD OUT !! BLUDOTONE Loop-A-Lator 超希少！！久々入荷！ 126,000円 SOLD OUT !! 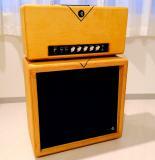 Divided by 13 BTR23 w.RockBlock キャビネット！超レア木目剥き出し！決算特価 326,000円 SOLD OUT ! !